Special Trophies: Fred Gilby for best player in Semi Final and Final. Jimmy Goonan captain and coach. Beasy, Byrne, Bell, Blackmore, Brewis, Brew, Carter, Connell, Duncan, Dunn, Donoghue, Davies, F. Irwin, Koops, Morrissey, McSwain, McAlpine, McPherson, Outram, Rumney, Vale, Watson. 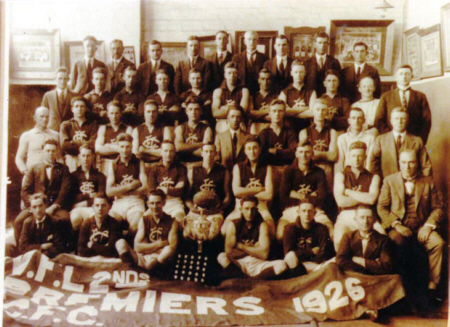 In 1926, Carlton won their first Reserves Premiership. The game was played on a Thursday - Melbourne Show Day, at the MCG. Goalkickers: Mullens (4), Davis (3), Way (2), McAlpine (1), Wright (1), Koop (1), Marchesi (1) and Robertson (1). Best: Gilby, McVay, Parkhill, Connell, Koop, Marchesi, Mullens, Robertson and McAlpine. Jack Way was a late replacement. The player who dropped out is unknown. This game was the curtain raiser to the senior Grand Final held on the M.C.G. on Saturday October 9. The Blues had the first use of the breeze. Both sides started the game with plenty of vigor, but Carlton's following division were on top, and three goals in the first eight minutes were the direct result of a winning ruck combination. Geelong got back into the game and the Blues led by 7 points at the end of the first quarter. Geelong attacked for most of the second term, but the Blues's backline stood up well. Carlton gradually assumed control of the game through two good late goals by Way and Marchesi, and at the main break held an 18 point lead. Carlton then dominated in the rucks and on the forward line. The Blues kept Geelong scoreless, while they added 6.3 in the third quarter. The Blues winning in all departments then ran out easy winners by 52 points. The game was a disappointment after the tense and exciting struggle these two teams had displayed in the second semi final. "A jubilant throng assembled at Fernshawe House, Carlton, on Saturday night, at the invitation of the Carlton Football Club committee, to congratulate the second eighteens on it's victory and wish the Carlton team a pleasant trip to Tasmania, whither they are going for a trip, in which games will be played and sight seeing shared. The Reserves Premiership was called the Rosen Cup. Goals; Mullens 8, Cornell 3, Lewis 3, Davis, Muir. The match was fairly even up until three quarter time. Melbourne asserted their superiority and the Blues forwards failed to capitalize on their opportunities. Carlton played Geelong at Princes Park. An exciting game where Davis scored his three goals in the third term. Geelong had the last kick of the game well within scoring distance, however, the shot missed and the Blues won by 3 points. The home team got off to a good start and led by 28 points at quarter time. This lead was reduced to just 7 points at half time, and by 9 points at the last break. South then put on 5.5 to the Blues' 1.5 to run out 33 point winners. Carlton played Collingwood at Victoria Park. Playing on a very muddy ground the Blues fielded a strong team, in fact the 'Woods had difficulty in putting a side together! Best; Robertson, Parkhill, Goonan, Wright, Vale, Koop, Connell. The ground was very muddy. An even game up until half time then the Blues got on top of the visitors. "Williamson a recruit from Woori Yallock, on his showing for two games will make a first-rate player." The Blues held a 34 point lead at the last break. In the last quarter the Saints dominated. They scored 5.4 for the term and Carlton only ventured forward on three occasions. Fortunately for the Blues each time they scored a goal and won the game by that margin. Best; Goonan, Quirk, Clark, Wright, Everitt. Carlton played Geelong at the Corio Oval. The weather was ideal for football and more than 2,000 were in attendance. Geelong led the premiership ladder, their last defeat was by the Blues at Princes Park back in May. Carlton were determined to knock off Geelong for the second time. However, a mishap on the Geelong Road meant that some selected players did not arrive at the ground on time. Carlton lost by 42 points. Geelong's second defeat for the season. Goals; Mullens 6, Davis 5, Dunn 3, Wright 2, Marchesi, Goonan. Best: Gilby (half forward), Robertson (centre), Dunn (forward), Davis (forward), Stone (wing), Mullens (forward), Goonan, Marchesi, Koop, Downie. Contributors to this page: blueycarlton , pblue , molsey , PatsFitztrick and WillowBlue . Page last modified on Friday 17 of November, 2017 09:26:40 AEDT by blueycarlton. 1988 Qual. Final - The Real Carlton. 1990 - Bradley; cricket during the day & footy at night.